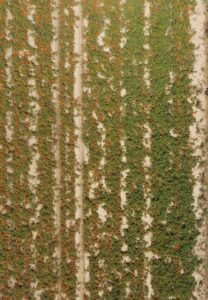 The images collected by the sensors are often inadequate to provide a useful representation and must therefore be digitally processed before being analyzed. Also in the video shooting, post-production plays an important role allowing you to extract from images the maximum of their communicative power. 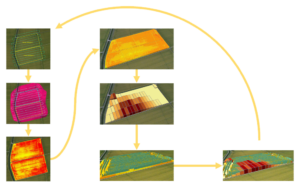 Diagram of rice paddy represented by the average level of the NDVI (a special Index used in Agricolture to represent crop vigor). 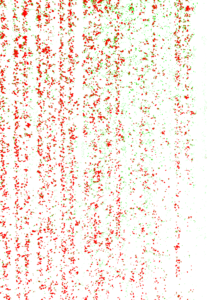 Yellow corresponds to lower values of NDVI, while red to higher values. These calculations allow you to get a view at a glance on a field’s health status. 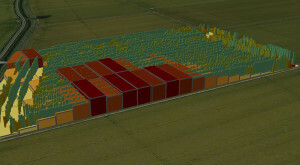 Graphic 3d processing of the overlapped production and fertilizing map to verify the results of a differentiated fertilization plan. Complete cycle of processing necessary for a differentiated fertilization project. As can be seen various stages of processing and comparison are required with data obtained on the ground and from the machines for fertilization and harvesting. Development of an industrial tomato cultivation. The processing allows to extract the pixels relative to the fruits through the evaluation of color and shape. The algorithm is able to calculate the total number of tomatoes , the percentage of ground cover, the average size of the fruit and the percentages of fruits according to different stages of ripeness. Thermographic analysis of photovoltaic panels wherefailed cells or cells subject to degradation are highlighted. The final report shows the type and severity of defects and the localization data of the involved panels. 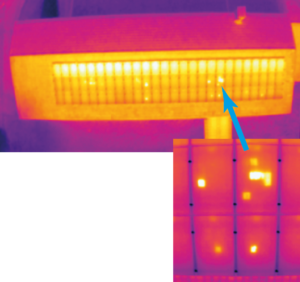 Thermographic analysis in the monitoring of a ceiling for an energy-saving project. 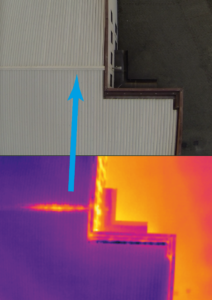 The roof of the warehouse shows an important heat loss, not visible from the standard picture.